Beautiful and durable, the maple Metal Framed Jewelry Display Case will complement your most precious jewelry in the most elegant fashion. 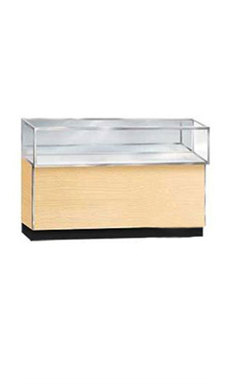 Providing customers a full, close up vision of the merchandise they are viewing, the maple jewelry showcase features a tempered glass top, front and sides. It utilizes mirrored sliding rear doors with a lock as well as concealed rear storage, so that jewelers can easily showcase and restock their jewelry. The case is constructed from a durable melamine maple laminate finish with aluminum metal framing around the entire case. Crating for secure shipping is included in the price of the case. Optional lock for rear storage area and light kit available, but sold separately.